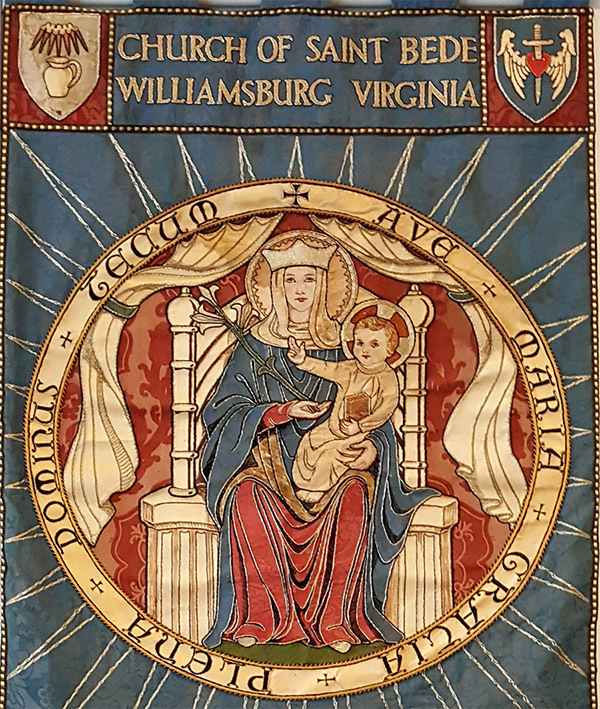 In August 2016 Bishop DiLorenzo appointed me director of the National Shrine of Our Lady of Walsingham in Williamsburg, Virginia near the College of William and Mary. This appointment is opening up for me a new appreciation of devotion to Our Lady which I would like to share with you on my blog, a devotion that is shared by Anglicans and Orthodox as well: a truly ecumenical devotion to Our Lady. Walsingham in England was a major center of pilgrimage during the medieval era, as were Santiago and Rome. I extend to you an invitation to learn more about this devotion to Our Lady through the resources that are assembled on my blog. In 1939, Father Thomas J. Walsh became the first resident pastor of Saint Bede. His tenure included the years of World War II when many servicemen were stationed in southeastern Virginia. 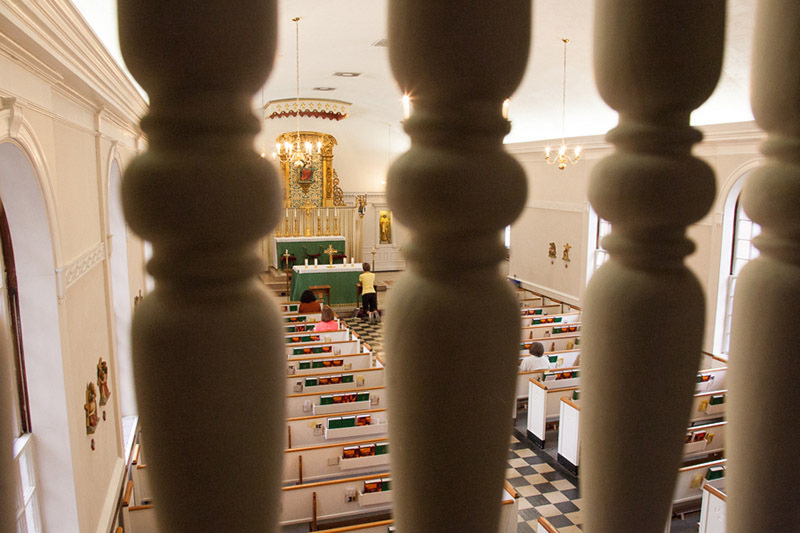 On September 8, 1941, the Feast of Our Lady’s birth, Father Walsh had the inspiration to dedicate the College Chapel to Our Lady of Walsingham. A Shrine in Walsingham, England had been built in 1061 by Richeldis de Faverches according to a vision in which the Virgin asked her to build a replica of the Holy House in Nazareth where the Annunciation occurred. The Holy House of Walsingham became a site for miraculous healing and pilgrimage until its destruction by King Henry VIII in 1538. 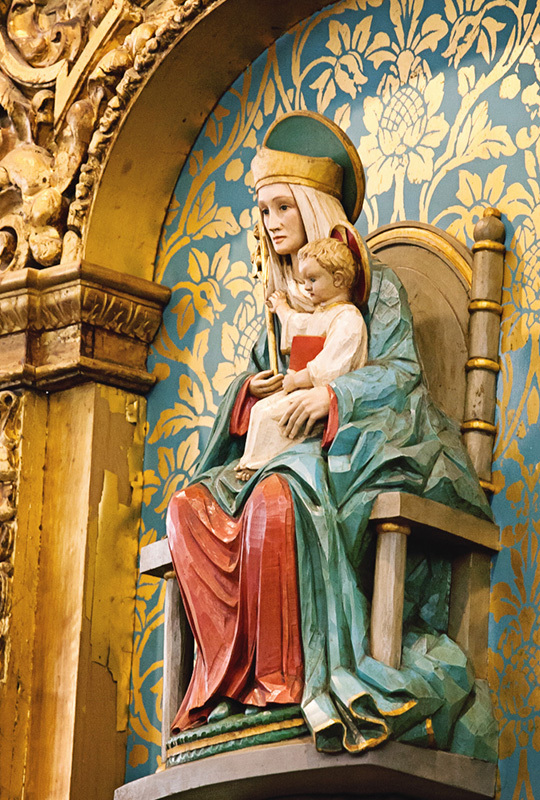 Three hundred years later, the Slipper Chapel was restored in Walsingham as a National Roman Catholic Shrine of England and in 1922 a carved wooden statue of Our Lady based upon the seal of the medieval priory was placed in the parish Church of Saint Mary in Walsingham. Father Walsh obtained a replica of this carved wooden statue of Our Lady of Walsingham for the College Chapel which reportedly was “carved in Walsingham by Lillian Dagless who designed and made almost all of the furnishings of the Slipper Chapel.” The College Chapel was dedicated as a National American Shrine to Our Lady of Walsingham on February 1, 1942, the Feast of the Purification of the Blessed Virgin. The National Shrine of Our Lady of Walsingham is located at 520 Richmond Road in Williamsburg, Virginia. Eucharistic Adoration takes place Monday-Friday from 7 a.m. to 7 p.m., unless otherwise noted in the bulletin. The Shrine is wheelchair accessible. Parking: there is a small parking lot right next to the Shrine. All Holy and ever-living God, in giving us Jesus Christ to be our Savior and Brother, You gave us Mary, His Mother, to be our Mother also. Grant us, we pray You, to live lives worthy of so great a Brother and so dear a Mother, that we may come at last to You the Father of us all, Who lives and reigns forever. Amen. Our Lady of Walsingham, Pray for us.